THE boat ride to Pulau Ayer Chawan was not much of a trip as sea voyages go, but it has proved the journey of a lifetime for engineer turned executive Gan Seow Kee. These days, Pulau Ayer Chawan has been integrated into the giant petrochemical hub Jurong Island and a highway whisks staff to and fro. But 35 years ago, it was a far different story. Mr Gan, 60, recalls having to wake up early every morning to catch the boat to a refinery in his job as an engineer. He still follows a similar routine these days - although the boat is no longer needed - but now he makes the journey as ExxonMobil Singapore's chairman and managing director. "Growing up, never in my wildest imagination would I have thought that I would be where I am today," said Mr Gan, who grew up speaking the Hokkien dialect and did not learn English until he started school. He has now been with ExxonMobil for 35 years, in a range of roles, including finance and sales, and in a variety of places. The energy giant posted him to the United States twice - first to New Jersey in 1992 and then to Virginia in 2012 - before he returned to take on his current role. His wife and two young children moved with him during his first stint, which lasted for about three years. "In those days, it was much tougher for families with children to come back to the Singapore system after moving abroad... We arranged for Mandarin tuition for the children when we were in the US," said Mr Gan. "The system is more accommodating of expats going overseas now, which is a good thing. We need to encourage Singaporeans to be prepared to work abroad." Singaporeans working in multinational firms have to be able to "operate across different cultures, especially when it comes to running a global unit", added Mr Gan. "You don't have to change your personality, but you need to have an appreciation of what works in different cultures and how people might respond. "The best way of getting the job you want is to do your current job really well." 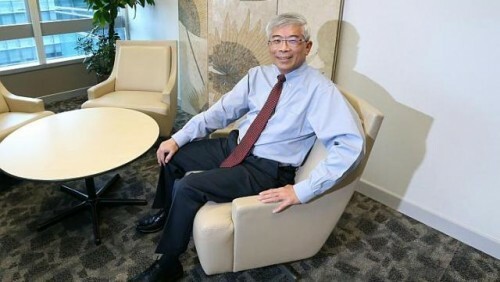 Mr Gan has been a witness to ExxonMobil's expansion in Singapore over the course of his career, a journey he describes as "tremendous and remarkable". The firm has grown from having two small refineries here to making Singapore its largest manufacturing site worldwide and its hub for the Asia-Pacific region. As well as investing well over US$10 billion (S$13.2 billion) here, the firm employs more than 3,200 staff in Singapore. One of Mr Gan's priorities is to develop Singapore talent for global roles in ExxonMobil. Almost all the company's functions are represented here, offering good opportunities, he said. "We are working to provide more opportunities for Singapore staff to work overseas or be involved in projects that cross boundaries," added Mr Gan, whose son and daughter are both working in the US. "The best predictor of how well a business will do is the quality of its people." Describing the business environment for firms in the petrochemical industry as "challenging", Mr Gan said ExxonMobil's focus remains on cost and energy efficiency.